Use bank reconciliation to ensure that all of the transactions on your bank statement have been entered into Wave and that you don't have duplicate income or expenses transactions showing up anywhere. Perform reconciliation once a month to make sure your records are up to date, and so you can be confident your reports are accurate! How do I start reconciling my accounts? You can get into "bank reconciliation mode" when you filter by Account on the Transactions page. Go to your Transactions page and click the Account: All filter. Select the account that you want to reconcile, such as Checking. Tip: Turn off any filters that you may have turned on so you can see everything up front. You should now see three boxes at the top of the transactions page! What do all of these boxes mean? The Ending Balance is what your online bank statement says is your balance as of a particular date. You can change this date by using the date filters. Let's say you look at your online bank statement from January 1st to January 31st and the ending balance is $1759.98. Select your date filters to January 1st to January 31st. Enter the Ending Balance that is shown on your bank statement. The Verified Balance is the total amount of transactions you have verified in Wave. Tip: Learn more on How to verify a transaction. Not all transactions have been verified. There are outstanding cheques that have not cleared the bank yet. These will appear in Wave, but might not be on your bank statement yet. There might be duplicate transactions, such as an invoice payment that was manually added and an imported income transaction. For more details on what has been verified and the difference click the + at the top right of Verified Balance and Difference. Now that I know all of this, what do I do? The goal is to get the Difference to $0.00. This means all of the transactions on your bank statement are in Wave. Let's say you have a transaction to categorize to meals and entertainment and it's unverified. Once I verify the transaction, notice the verified balance increases and my difference increased because it was another expense. But don't get discouraged! Just keep categorizing and verifying. I have only one transaction left to verify in my list. It's an income transaction for the remaining balance. Success! My difference is now $0.00 which means Wave matches up with my online bank statement. The account is now fully reconciled! Filter by account to get into "bank reconciliation mode". Turn off any filters except the date range you want to look at. You can reconcile at any time during the month, it doesn't have to be a month at a time. This tool is only available for cash, bank, or credit card payment accounts. You will not be able to reconcile accounts like Owner Investment or Shareholder Loan. Click the Accounting > Reconciliation tab in the left-hand menu. Select the account you wish to reconcile from the drop-down on the top right of the page. Locate the month you wish to reconcile and click the button to Start. Enter the Ending Balance for this account based on the last date of the month you're reconciling. (You will be able to find this information on your bank statement or online bank account. 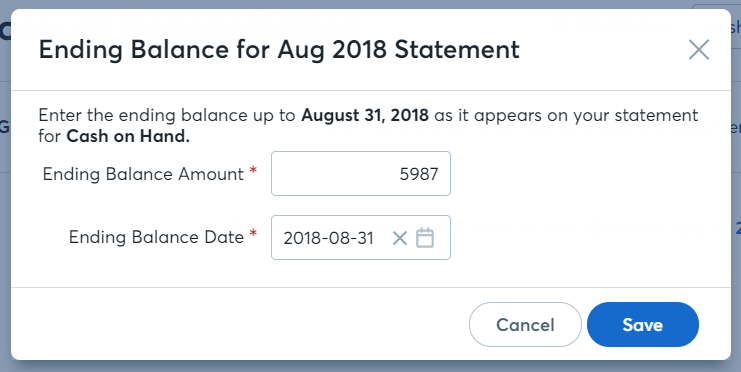 Once you have entered the Ending Balance and confirmed the date to be correct, click Save. Review the transactions for that account in Wave and compare it against your bank or credit card statement for that month. You're done reconciling when the ending balance in Wave matches the one from your bank statement.